Thanks to a very generous Thrasher's Wheat reader, we're thrilled to be able to offer 2 free tickets to the upcoming Sarah McLachlan Foundation concert. 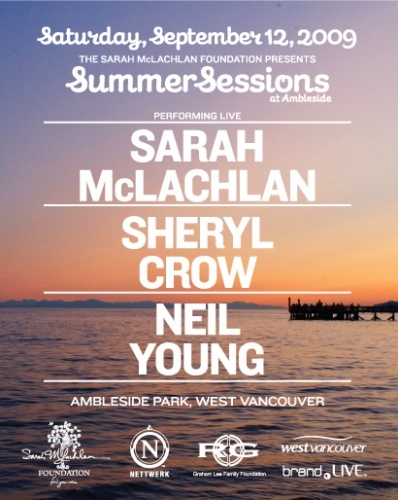 The benefit concert features McLachlan, Neil Young and Sheryl Crow on Saturday, Sept. 12, at Ambleside Park in West Vancouver, Canada. The concert sold out within hours of going on-sale. The McLachlan Foundation provides free music programs to youth in "under-served communities" such as Vancouver's east side. This includes "high-quality instruction in guitar, piano, percussion and choir." To enter the contest, see instructions below. One lucky Thrasher's Wheat supporter will win a free pair of concert tickets. We truly appreciate being able to what we do here at TW, and we love being able to give something back in return. All Thrasher's Wheat supporters between now and 12:00 Noon EST, Monday, September 7 12:00 Noon EST, Tuesday, September 8 will be automatically entered into the ticket drawing. Click below to send support to Thrasher's Wheat now via Visa or Mastercard — or send support via Paypal. Click here for why we need your support to continue operating Thrasher's Wheat. In addition, Thrasher's Wheat will match the winning donation and make contributions to both the Sarah McLachlan Foundation and The Bridge School. Is it a little annoying to see Neil Young billed third under Sheryl Crow or is it just me? Who's the legend again? I'm sure its meaningless though. It's really a nice thing for someone to donate the tickets in this fashion. there are plenty of Sheryl Crow fans who resent your remark. why have the downloads seemingly stopped? Has Neil abandoned the format? Months ago you mentioned a whopper of a download, something we'd all be in awe of - well, no disrespect to Here We Are in the Years - but I was expecting something a bit more, umm, meatier! If you have a moment, can you fill us in? I think Archives fans everywhere would love an update.